Vodafone have announced two of the cheapest phones ever and we do mean they make a cup of coffee look expensive. Meet the Vodafone 150 and the Vodafone 250, which one-up even Nokia's entry-level phones. The Vodafone 150 harks back to the early days of mobile phones. It can store 100 contacts, has 500mAh battery that lasts 400 hours of standby and 5 hours of talk time. The phone works in 900/1800 MHz GSM networks. It charges through a miniUSB port. 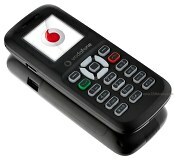 Beside that, the Vodafone 150 also supports mobile payment services and has a flashlight on the back. The Vodafone 250 is more, um, advanced. It has a slightly bigger color screen - a 1.45" CSTN display of 128 x 128 pixel resolution - and is equipped with an FM radio with stereo headset support. The rest of the specs are the same - 500mAh battery, 400 hours standby, 5 hours talk time, miniUSB port, 100 contacts and a flashlight. The Vodafone 150 and Vodafone 250 will launch first in India and 6 markets in Africa - The DR Congo, Kenya, Mozambique, Qatar, South Africa and Tanzania. The Vodafone 150 costs 15 US dollars (11 euro) unsubsidized and the Vodafone 250 is priced at 20 US dollars (15 euro).